Here's my cake from course 2. Unfortunately, we only got to put together one cake for this course. So what did we do for the rest of the class? Well, all the bright and lovely flowers that are on my cake is what we made every week. Pansies, Daisies, Violets, Roses, Daffodils and Apple Blossoms. The flowers were made of royal icing so they harden up. We made a different one each week and placed them in flower formers to dry up. 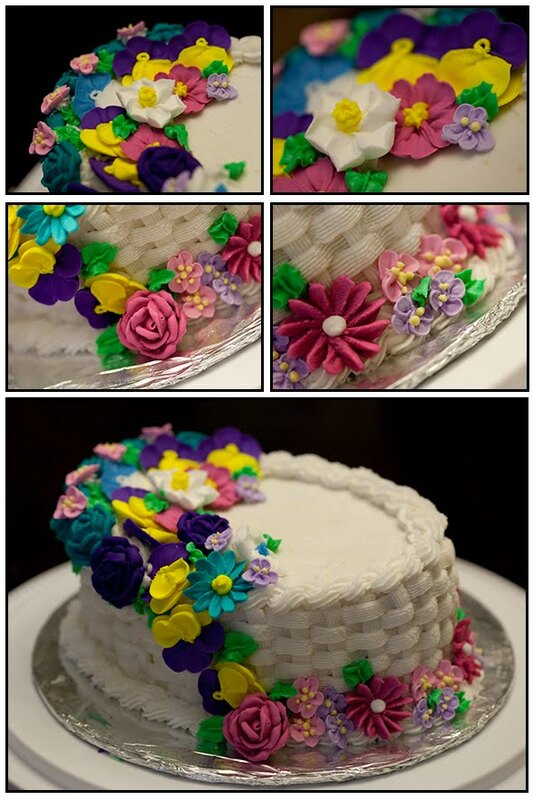 Week 4 rolled along and we brought all the flowers we had made and place them on an iced cake and completing the cake with a rope border and a basket weave. I love bright colors and so i made my flowers bright. Everyone else chose to keep it subtle with pastel colors. For the cake, i made a Sponge cake and filled it with blackberry jelly.